we all have come across this delicious nigerian soup made from melon seeds,its has a great taste and aroma. 2 handsfull chopped ugu leaves (pumpkin leaves). 1 tbsp grinded cray fish. 1/2 kg beef meat,cowstrip,intestine etc. wash and cook the meat, stock fish, cow intestine, pomo, cow strip with onions,salt to taste and stock cubes together. Now remove the meat from the pot leaving only the meat stock and set on the cooker. Boil the meat stock, add ground egusi and ground cray fish into the pot of meat stock. Now keep cooking, stiring the egusi while add water if it dries up, this process should take at least 30mins on low heat. Cook the egusi till very tender or till you notice some oil puree on top. Keep stiring and cooking while adding water when every it dries up. After 30mins and you are satisfied it the thickness of the egusi if you are not add little water to your taste. Add the palm oil and blended atarodo and cook on low heat while stiring for another 15mins. After 15mins pour back the meat /stock fish etc back into the pot. Add ugu /bitter leaf depending on which ever one you are using. Allow to simmer for 5mins and it’s ready. 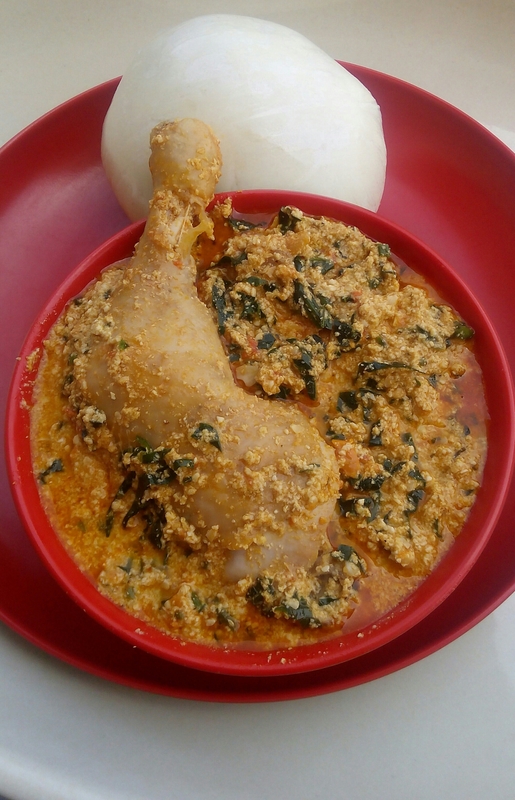 serve with eba pounded yam etc.